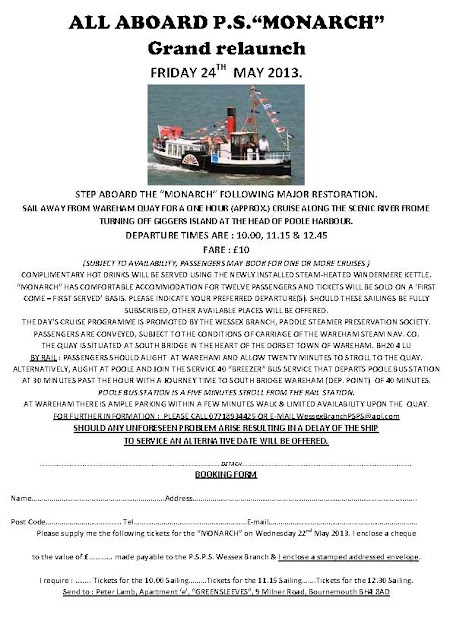 The small Paddle Steamer Monarch is due to enter service in May this year offering cruises along the river Frome from Wareham Quay. Monarch was built in 1984 and has seen service in Kent and on the Medina in the Isle of Wight. Extensive refurbishments have been carried out which involved her sponsons and paddle wheels being removed. The Wessex Branch are chartering the vessel for a day on Friday 24th May. Further information is given on the booking form below.